Three months ago the tiki gods smiled upon Walt Disney World with the opening of Trader Sam’s Grog Grotto. This ornate tiki bar on steroids is a must-do for tiki culture enthusiasts and Disney fans alike. Now that the initial wave of hype and pandemonium has receded, the Grog Grotto is even more enjoyable. One of the best features of this exotic themed bar are the Trader Sam’s Grog Grotto tiki mugs. 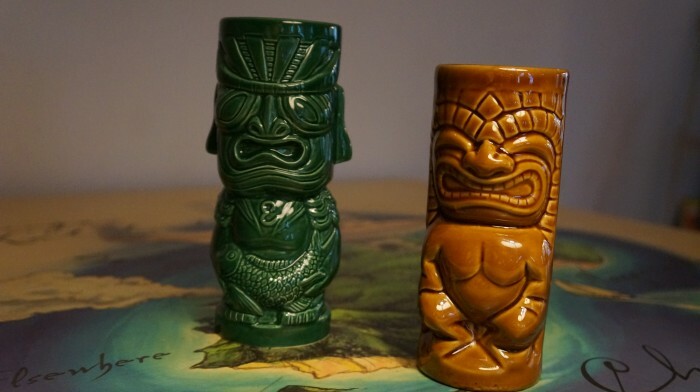 True to the authentic tiki bar experience, there are a variety of souvenir tiki mugs that are quite the hot ticket items. I am a fan of the tiki culture, though not an expert by any stretch of the imagination. 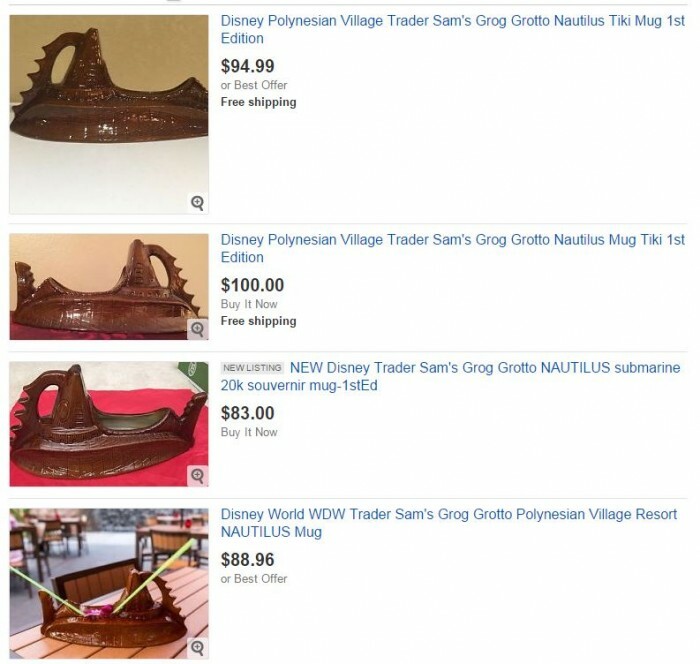 However, I love both Trader Sam’s locations and have acquired a collection that I would like to share with you along with as much information as I can about these unique keepsakes. I know I have a lot to learn about this fascinating, entertaining fandom. Suffice to say, I dabble. So in recognition of my basic knowledge I took to the interwebs to get some knowledge. At the most basic level, it is understood that tiki bar culture and the ritual of elaborate ceramic tiki mugs started in California. After World War II many service men return to the United States with a hunger to enjoy South Seas culture. Tiki bars and Polynesia style restaurants became all the rage. It quickly became customary for the delicious, exotic elixirs to be served in elaborate ceramic and glass tiki mugs at such establishments. A menagerie of styles all over the country could be found. Varying from tall highball style to short, rotund and even large bowls, all in a vast assortment of shapes like coconuts, barrels, hula girls, bamboo stalks, parrots, the list is nearly endless. 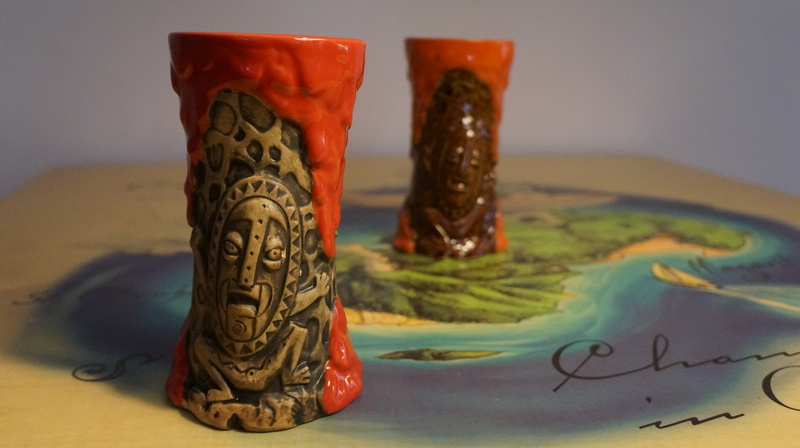 One of the motivations for these ornate tiki mugs becoming such a large part of tiki culture is that they are meant, in part, to represent the tiki totems found throughout the South Seas. Often carved in wood, the primary purpose of a tiki totem or statue is to scare away evil spirits. 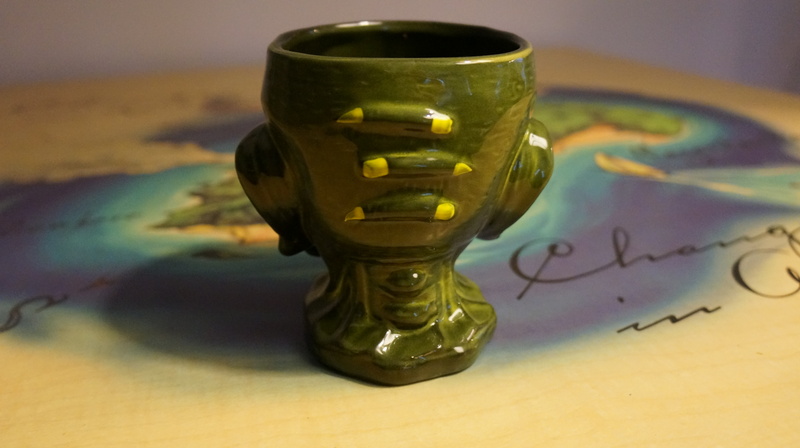 So with that purpose in mind, what better way to get happy than to sip a refreshing rum drink from a tiki mug? 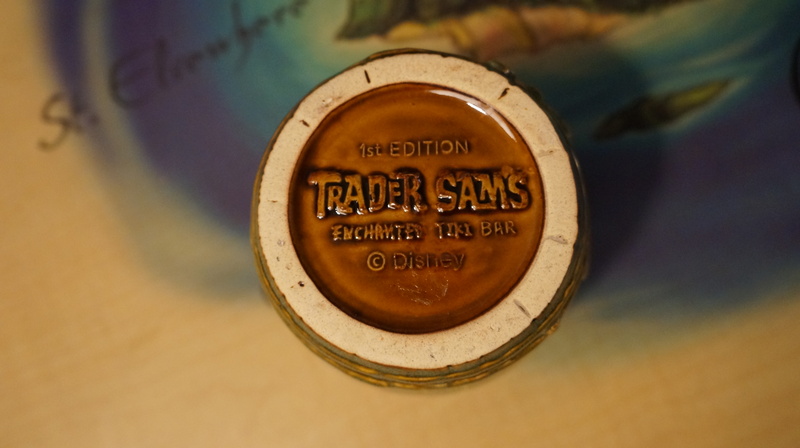 In a previous Touring Plan’s blog post, I discussed the differences between Disneyland’s original Trader Sam’s Enchanted Tiki Bar and Walt Disney World’s Trader Sam’s Grog Grotto. 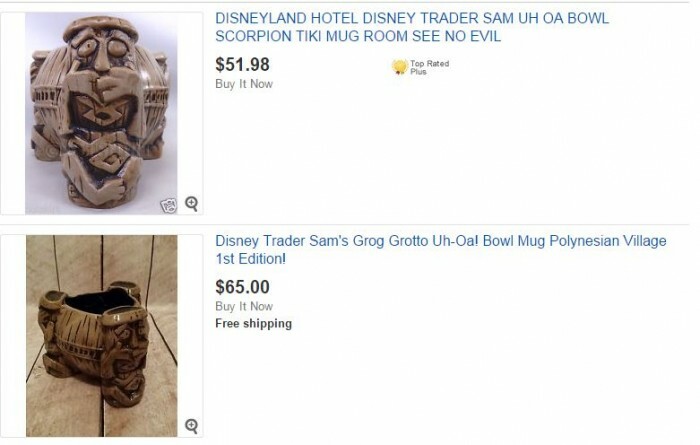 One brilliant way the two locations are linked together, yet distinguished from one another is how their tiki mugs are variations of each other. Disneyland’s Trader Sam’s Enchanted Tiki Bar at the Disneyland Hotel can be credited with both introducing Disney fans to tiki bar culture and introducing tiki enthusiasts to the Disney way of doing things. 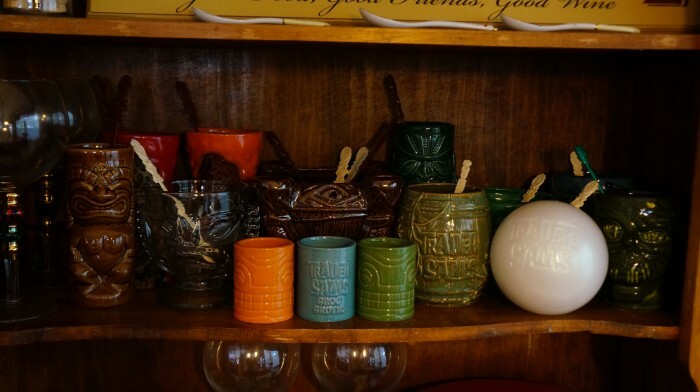 This original location also produced some of the most fun, detailed, tiki mugs seen in decades. The Krakatoa, Uh-Oa bowl, Hippopotamaitai, Shipwreck, and the Shrunken Zombie Head all rolled out during the first year of operation. 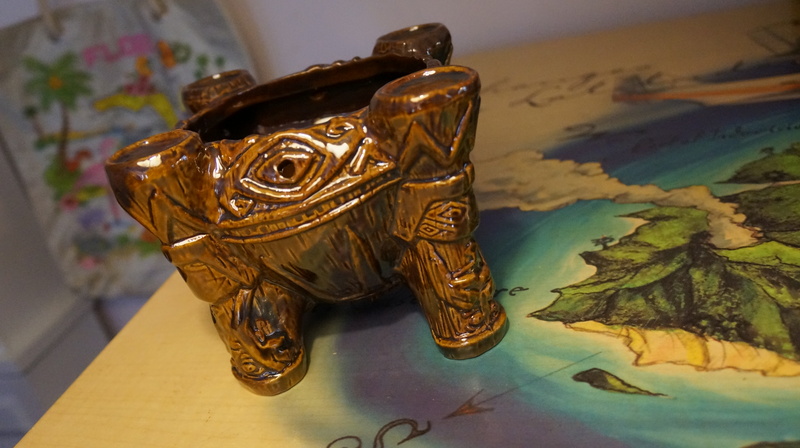 It was hard to resist Disney’s versions of such unique collectibles. 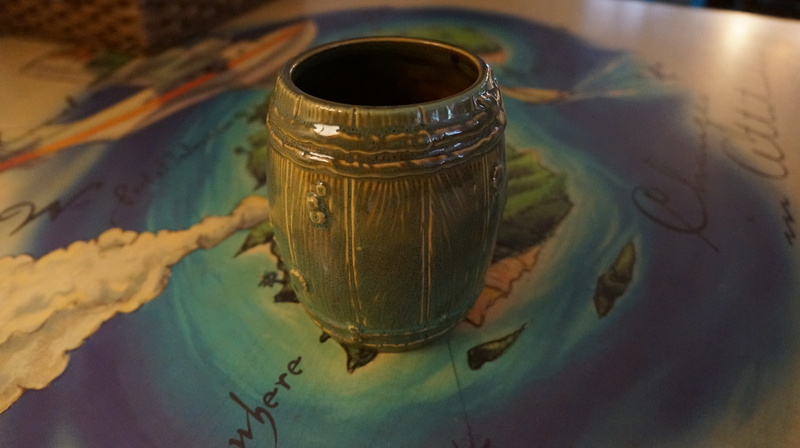 One of my biggest regrets was leaving behind a 1st edition Shipwreck mug upon checking out of our villa at Disney’s Grand Californian a few years ago. I called the hotel multiple times after realizing I had left it, but it turns out the beloved mug was lost at sea…but I digress. 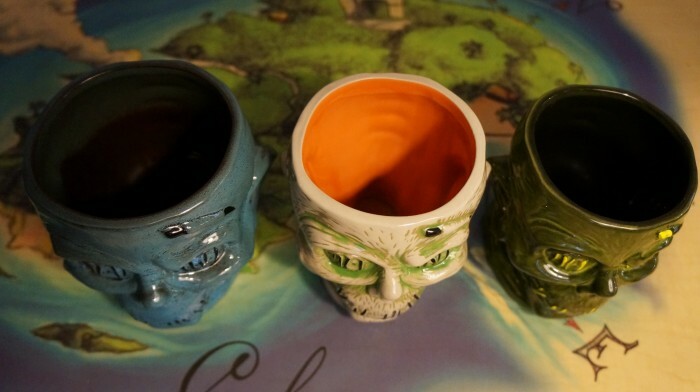 Let’s talk about the mugs you can find at Trader Sam’s Grog Grotto. Before we get into the specifics of each mug, the subject of price should be discussed. 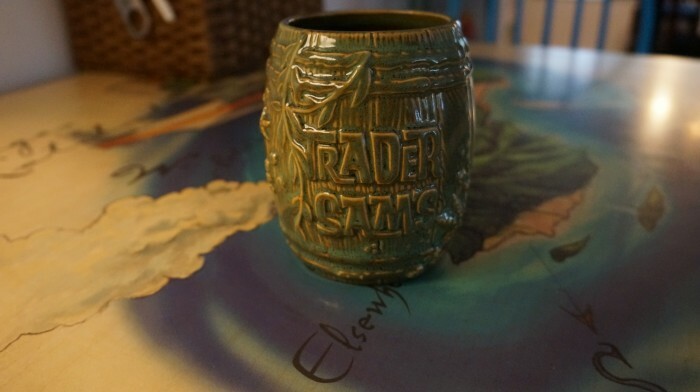 I’ve asked numerous Trader Sam’s Skippers and other Cast Members and there does not seem to be a way to purchase one of the souvenir tiki mugs without purchasing the corresponding drink that is served in it. If you really want a mug without resorting to eBay you could, in theory, order the appropriate drink and just ask the Skipper to simply not make the drink. However, you will be charged the full price for the beverage and mug and the official policy is the only way to get the mug is for it to be served with the official drink. 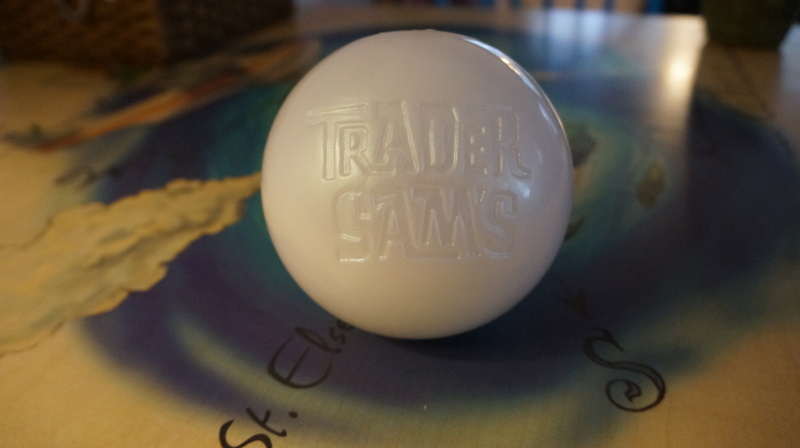 This has to be one of the rare plastic souvenir tiki mugs of the world. I suppose it’s more of a cup than a mug, but it’s a great option to use outdoors or poolside without having to worry about breaking it. Its round, smooth shape makes it reminiscent of drinking from a coconut. A flat base rests at the bottom, but positioned at an angle so the cup and its opening are titled when resting on the bar. What I like most about the pearl is the size of the Trader Sam’s logo. Much like Disneyland’s shipwreck barrel, the logo is very prominent. Not all tiki mugs make their origin known proudly, but the pearl certainly does. The Polynesian Pearl effect is not all that impressive, but I kind of like that out of all the different effects, there is one that is short, sweet, and simple. Plus, there’s the anticipation and hope that someone, maybe even you, will get the elusive black pearl. It’s been said about every 1 in 100 pearls will be a black pearl. The Uh-Oa drink is an impressive combination of premium rums and juice, topped with flaming sugar cubes accompanied by ground cinnamon to be sprinkled into the flame for a sparking effect. This is essentially Disney’s version of a Scorpian cocktail, a traditional flaming elixir. Served in a must-have tiki bowl, this drink is perfect for celebrating a special occasion with friends. The Grog Grotto’s 1st edition of the bowl is very different than Disneyland’s original 1st edition. The original version is a deep brown color with glossy finish. A rather larger bowl is supported by four tiki pillars. Grog Grotto’s version, which is also Disneyland’s 2nd edition version, is slightly smaller and is supported by three comical tikis. 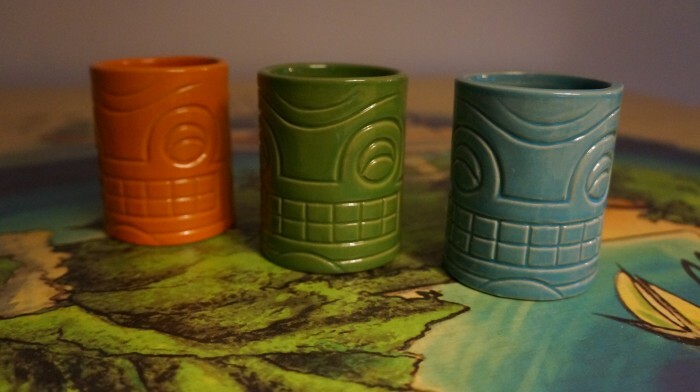 These tikis are acting out the famous “see no evil, hear no evil, speak no evil.” It is a much lighter color and a matte finish. Personally, I’ve yet to purchase the Uh-Oa at Grog Grotto; I am holding out for a special occasion. This behemoth usurped the Uh-Oa’s place as the drink to order to make one heck of an impression. Ordering the Nautilus is a pretty big deal. The Nautilus’ effects inside the Grog Grotto are the most elaborate and encompassing. The “mug” itself really is a vessel. After enough sips of the strong concoction contained within, you may be tempted to take your Nautilus out for a spin on Bay Lake. There are occasions in which the Nautilus mug is out of stock, though these instances have become very rare if not non existent. It’s detailed. It’s large. The emblem on the bottom is the only mug to include “Disney’s Polynesian Village Resort.” It pays homage to a gone, but never forgotten attraction. This is the tiki mug to beat. This is another one on my very special occasion list. I suppose if you can’t make the trip to Disney’s Polynesian, but really for almost double the cost and no rum inside, is this worth it? 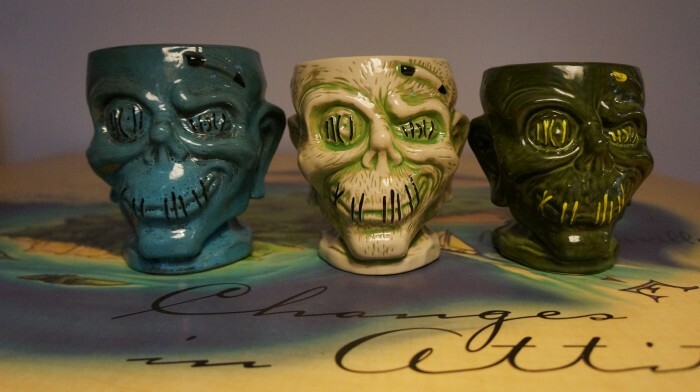 At first I didn’t really appreciate the Shrunken Zombie Head mug. 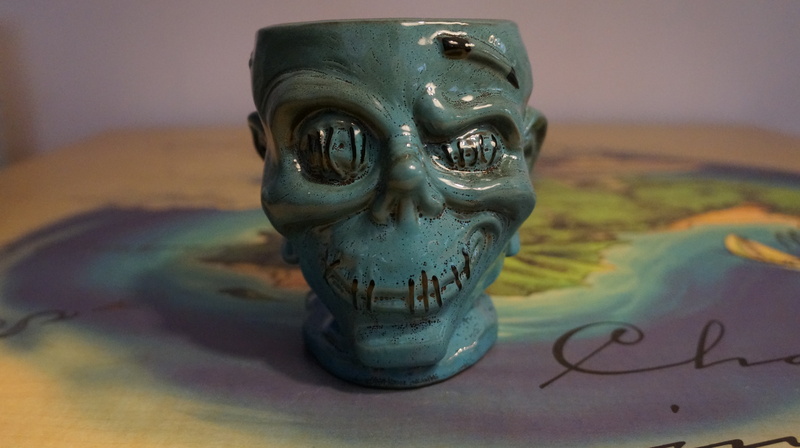 Sure the Zombie drink is a classic tiki bar staple and has a mesmerizing quality, but the motif of the mug itself didn’t feel enjoyable to me, I mean, it’s kinda creepy. I’ve since changed my tune. It really is a cool looking mug, very intricate. 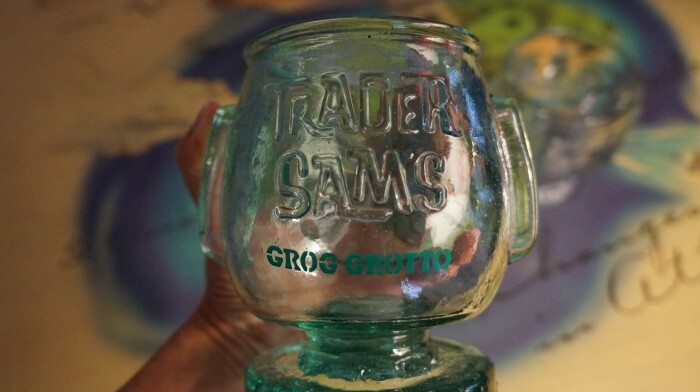 What’s really interesting about this mug is that the current 1st edition from Trader Sam’s Grog Grotto is actually the fourth variation of this mug. 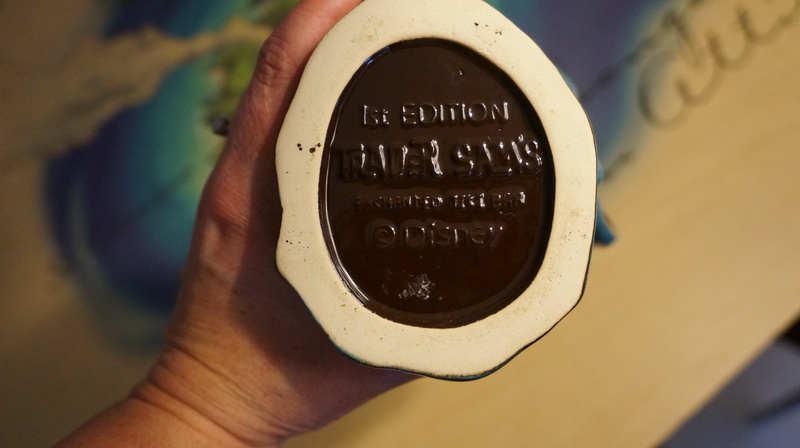 The original 1st edition at Disneyland is a deep, teal blue with a black glaze in the facial details and in the interior of the mug. Personally, this is my least favorite of the color variations. The 2nd edition at Disneyland is mug more appealing to me. The base color is beige, and this is offset by a bight green glaze set into the facial details. This edition has a lot more visual texture. To top it off the interior is orange. The whole color combination of this edition is really interesting to me. The Trader Sam’s Grog Grotto 1st edition is all about green. The base color is a deep green, evocative of seaweed. The facial features really pop thanks to the bright lemon yellow color. It is a creepy, yet comical color combination in which the stitching on the eyes and mouth really stand out. I mentioned a fourth variation, it is by far the most rare and sought after. In October 2014 a “hard ticket” event was held at Trader Sam’s Enchanted Tiki Bart at Disneyland, called Mahaloween. The best piece of “swag” attendees received at this event was the special edition Mahaloween Shrunken Zombie Head. It is similiar to Disneyland’s 2nd edition colorization, with a light tan base, but instead of a lime green accent glaze and orange interior, a deep blue was used. This is perhaps my favorite drink name on the menu. It’s so fun to say and such a clever play on words. The Hippopatamaitai is offered at both Trader Sam’s locations. This tiki mug is my favorite to use at home since it is glass and just so dang cute. The tiki face resembles the shrugging tiki statue that’s featured in the Polynesian’s lobby (and throughout the resort). This tiki is said to resemble Maui who is legended with having convinced the sun to shine longer making the days last longer. 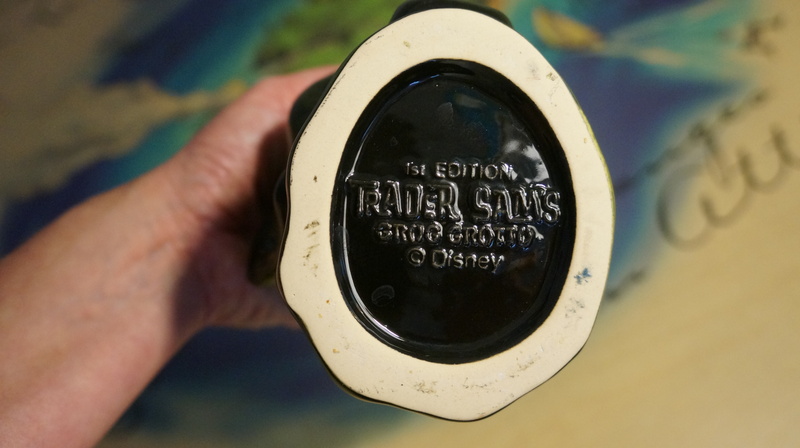 The back of the mug sports a large, raised Trader Sam’s logo with “Grog Grotto” painted on the back. It is produced in Mexico (as opposed to China like the rest of the mugs) and the craftsmanship of the glass is pretty evident. 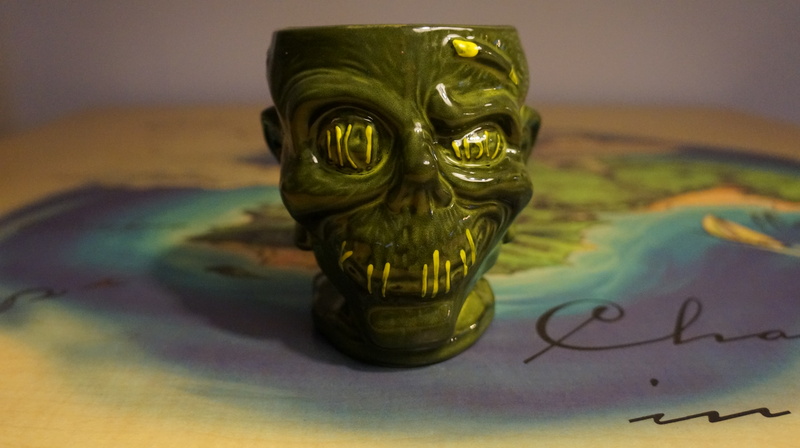 This might actually be my favorite of the Trader Sam’s Grog Grotto tiki mugs. Like the Shrunken Zombie Head, the 1st edition Krakatoa mug at Grog Grotto is the same exact mug as the original at Disneyland. The Grog Grotto’s version has bright red lava flowing at the top and settled around the base. The body of the mug is a matte finish and deep khaki color. Whereas the Disneyland version has burnt orange lava, golden brown body, and a shiny finish. The tikis on either side of the mug are pretty fun, but overall these particular design doesn’t enchant me as much as the others. Another very unique to Grog Grotto offering is the rum flight. The minute I saw that this rum flight would be served in three mini ceramic tiki mugs I, like so many others, had to have these little triplets. The rum flight itself is fun to try, and gave me a new appreciation for fine, aged rum — though once is enough in my opinion. But once is all it takes to be able to take home these little cuties. 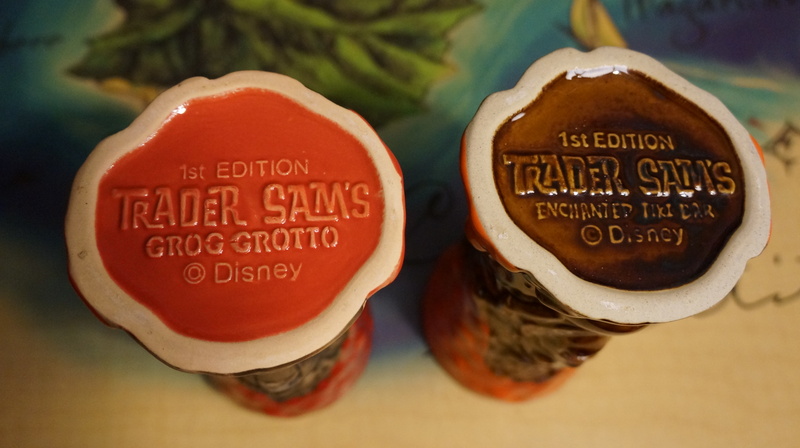 They share the same exact tiki face and Trader Sam’s logo, but the three colors complement each other yet are distinctive enough to make this set interesting. You gotta hand it to Disney for really researching true, authentic tiki establishments before creating both Trader Sam’s locations. And when it came time to commission the creation of their tiki mugs they employed one of the best. 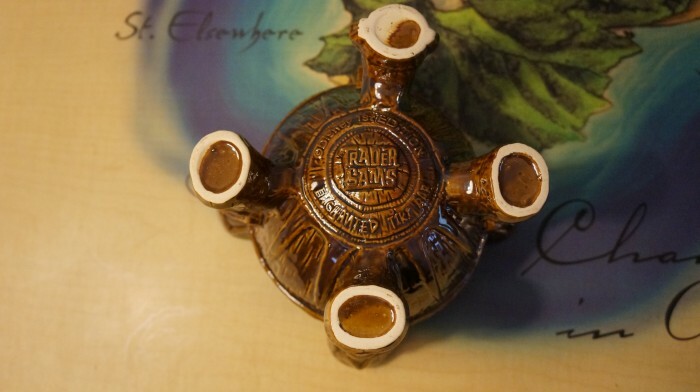 Tiki Farm is one of the largest (if not the largest) manufacturer of tiki mugs. Their mugs usually sell for at least $20 so when you look at Disney’s prices of their mugs and drinks together, it’s not a bad deal at all. Their portfolio is pretty impressive and it is evident that they are very passionate about what they do. During your travels to Florida you might want to make time to check out some other tiki bars and establishments. 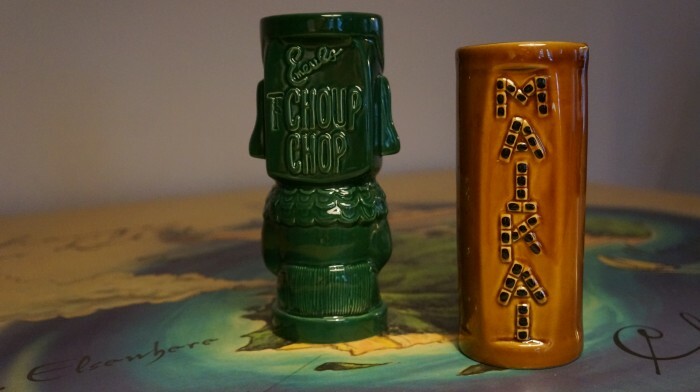 You can also add more tiki mugs to your collection by heading over to Universal Orlando and enjoying a meal and impressive cocktails at one of my favorite restaurants, Emeril’s Tchoup Chop. Here you can order the intoxicating Moai Punch which is served in a beautiful tiki mug. Although it is only one color, it is still one of the most beautiful mugs in my collection. It too is manufactured by Tiki Farm. I think it makes a great memento of a visit to Orlando. If you have more time to explore more of Florida, consider a trip down to Fort Lauderdale to visit the mecca that is The Mai Kai. This amazing Polynesian restaurant is absolutely incredible and has been in business since 1956. 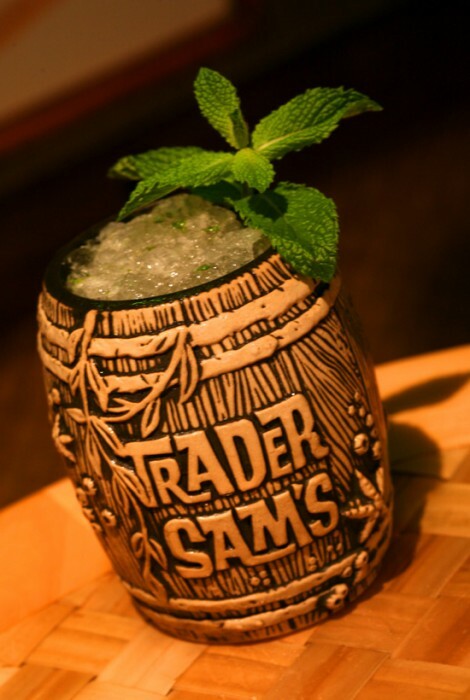 It also served as inspiration for both Trader Sam’s locations. In fact, I know of two tributes to The Mai Kai found inside Trader Sam’s Grog Grotto. Their drink menu is one of the largest I’ve ever seen in my life and so many of them are served in simple, but classic tiki mugs. Currently only one is available as a souvenir, but it is one of my prized possessions. I may not be a full fledged tiki enthusiast, but as my tiki mug collection grows, I’m starting to think I may be becoming one. Trader Sam’s Grog Grotto offers an unforgettable experience. It is the perfect place to kick back and have a thoroughly enjoyable evening. Returning home with a exclusive tiki mug makes it easy to drift off into memories of such an awesome place. How Often Do Disney World Park Hours Change? Thank you for showing all the variations on the mugs. 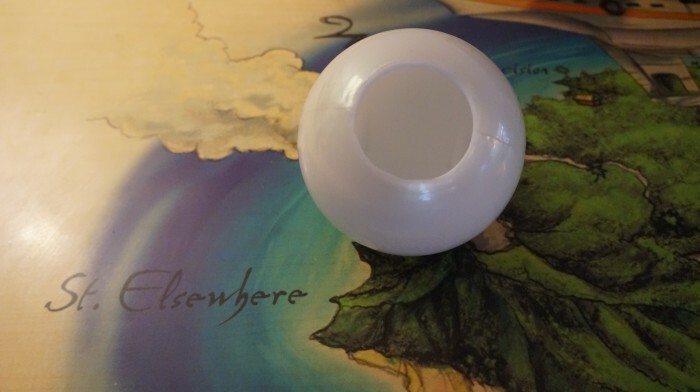 So far we have the pearl, Hippopatamaitai and the Krakatoa. Two of the mugs could have come with a better drink mix in our opinion, I won’t say which and leave it up to everyone to find out on their own. An interesting note about the Grotto Grog Krakatoa mug: when ice is added, the character parts of the mug turn frosty cold. It’s really a very “cool” tactile effect. Next up on my to-get list: the Nautilus. Hi Kim, thanks for reading and great comment! Good point about the Krakatoa mug. It seems the mugs with a matte finish are that way, nice and icy cold. 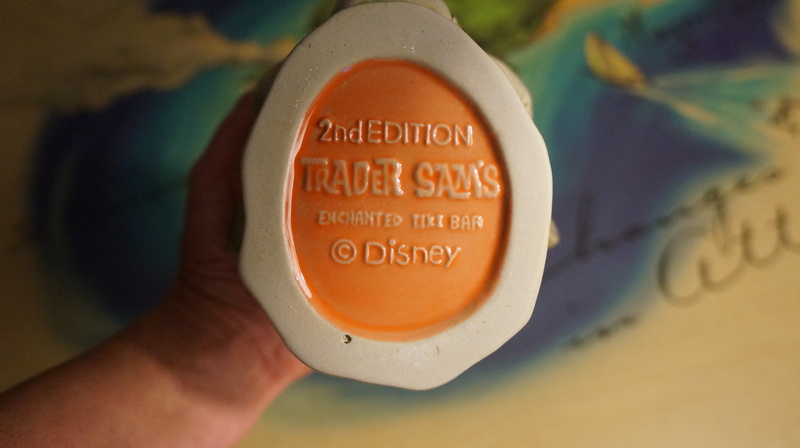 I say that because the 1st edition Shipwreck Barrel from Disneyland was matte and it too was ice cold on the outside. I miss that mug SO MUCH, can’t believe I left it in the hotel room never to be found again 🙁 (sorry still getting on over it). Is it possible to order these drinks without the alcohol? I am a big Disney fan and love the mugs but I do not drink. I enjoyed a shipwreck at DL and researched the recipe to make at home. A non alcoholic version of this particular cocktail would be a few wedges of lemon and a leaf or two of mint. It would be great if they offered an alcohol free version for non drinking adults – and those under 21! To be honest I’m not really a collector so while I do appreciate the mugs, I probably won’t ever purchase one. I’m glad to see that the Polynesian Pearl is available as a drink only option. When I was at Trader Sam’s during pre-opening, the bartender told me it was the item on the menu not available as drink only. Also I could be wrong, but I think that early on the Uh-Oa first edition was also sold at Grog Grotto. Someone else in my party ordered it and I distinctly remember it having 4 legs. 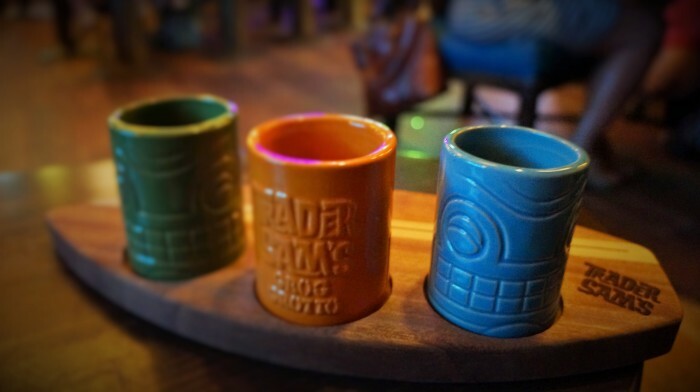 You are not mistaken – during the soft opening, all mugs except for the Polynesian Pearl and rum flight mugs were straight from the Disneyland Hotel’s bar. I saw both the 3 and 4-legged version. 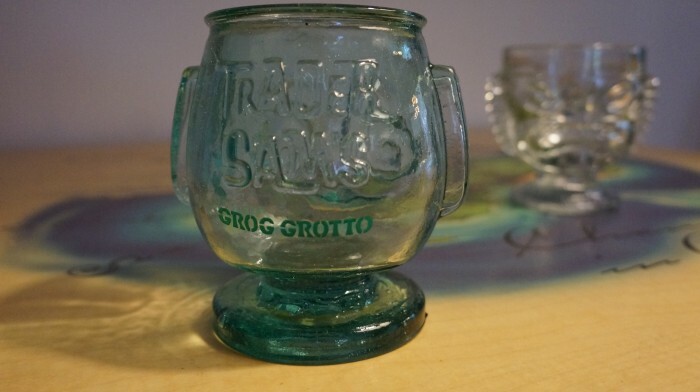 I think Grog Grotto will get its own Uh Oa bowl someday, but for now it seems to be just using Enchanted Tiki Bar’s. 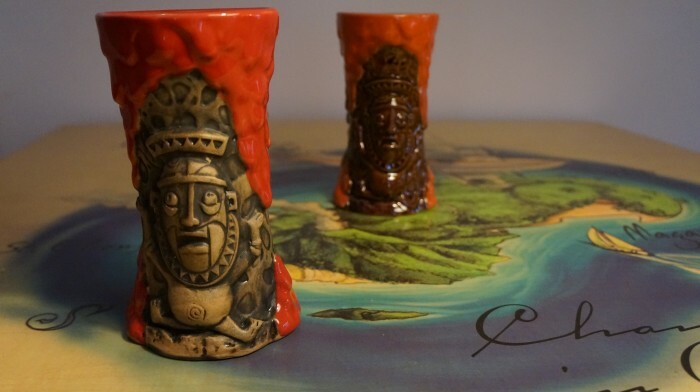 I’m sure you’re aware, but Enchanted Tiki Bar’s Krakatoa Punch 2nd edition mug looks very much like Grog Grotto’s these days, only keeping the orange lava glaze with the newer beige body. 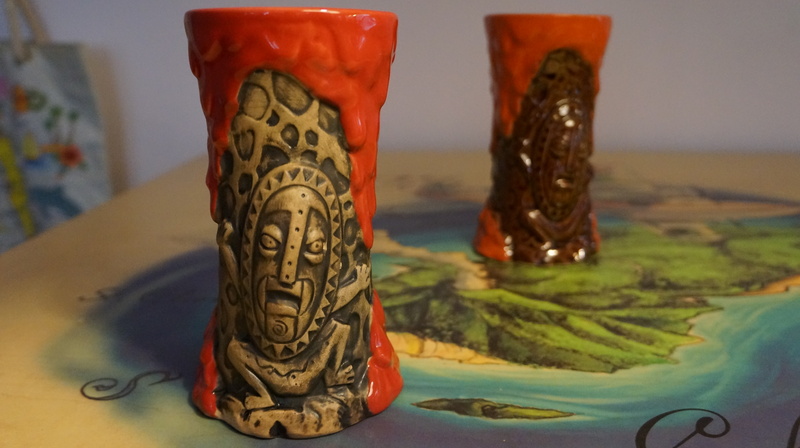 I’ve never been a fan of the Krakatoa mug mostly because it looks like nacho cheese oozing out the top – Grog Grotto’s red glaze is much better. I am confused why the author is bringing up restaurants at Universal and Fort Lauderdale, when the title of the article is clearly a guide to the tiki mugs at Trader Sam’s. The titular bar ware was pretty well covered, and the other information was for the added benefit of people that might be interested in branching out. Live a little! I liked your article Dani! I wish there was a way to not have to buy the drink though as I do not drink and I don’t particularly want to have to something and not even drink the drink. The Hippopatamaitai is a life changing experience. Just an amazing delicious drink with nuance and balance (rum, almond, orange, lime). The rest are more or less fruit juices and rum. Dani: You mentioned that The Mai-Kai has only one souvenir mug available. While only one can be purchased with a drink (like Trader Sam’s), there are often a half-dozen or so other mugs (including the famous Mystery Bowl) available in the restaurant’s gift shop (unlike Trader Sam’s). Recently named to the National Register of Historic Places, this 58-year-old landmark was reportedly visited by Walt Disney during one of his early Florida research trips. 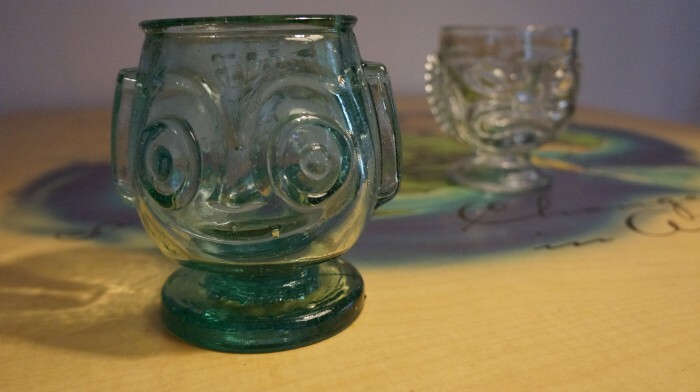 Well worth a trip south by any Disney fan with an interest in Tiki. I heard about Mai Kai a few months ago and I will be in Ft Lauderdale area before heading up to WDW, so will for sure check this out! Just wanted to note that I have been able to buy mugs at the Disneyland location without the drink. As everyone knows you can use your AP Discounts on alcohol but I was able to use it on just the mug purchase to the bartender and my surprise. Just a tip! Hope they come out with more editions!! That’s one of the differences between CA and FL – you can’t buy mugs standalone in Florida and your discounts, to my knowledge, don’t apply. Yet one more reason why I heavily favor Enchanted Tiki Bar over Grog Grotto. 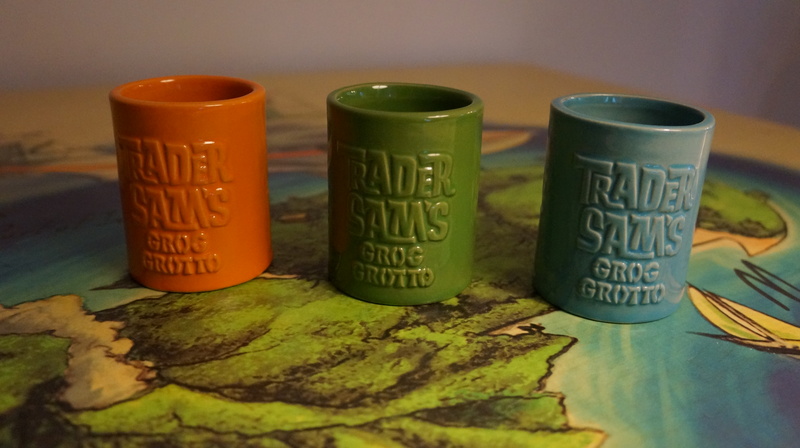 I’ve been lucky enough to collect all of the Grog Grotto mugs, including the Cali ones that they were using during the soft opening! Now I just sit and wait until a new series comes out. My wallet is thanking me that they don’t get released often! Anyone know how often they’re refreshed? Also to my knowledge the black pearls haven’t been put into circulation yet. There was one or two that were given out during the soft or grand opening but it’s not consistent.